The Futurist: "Mr. Gorbachev, Tear Down This Wall." 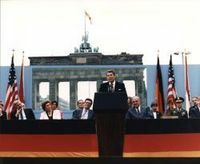 It was 20 years ago today, on June 12, 1987, that President Ronald Reagan delivered his famous speech at the Berlin Wall. Audio highlights are available on YouTube over here. In studying this speech, the timing and political tactics of it, particularly when viewed in historical context, are extraordinary. Reagan could have delivered this speech at any time, but chose to do it only after 6.5 years in office. Perhaps it is just a coincidence, but perhaps Reagan saw signs that by 1987 the USSR's economy was teetering on the precipice of a downfall. Perhaps Reagan saw in Mikhail Gorbachev the first Soviet leader who truly wanted the USSR to reform. It was thus the ideal time to remind the world, now in an era of cable television, that the USSR was not willing to let East Berliners interact with the Western world. It was the ideal time to demonstrate that communism could not attract people to it by their own free will. It was the ideal time to gain a psychological monopoly on the universal concepts of aspiration and hope, in a speech audible on the other side of the wall. If Gorbachev was truly a reformer, there was only one way to indisputably prove it. But did a mere speech really have such an effect on a powerful empire? Just because the Berlin Wall fell just 2 years later, and the USSR itself peacefully dissolved just 4 years later, does not mean the speech was anything more than well-timed and inspiring. The trend of nations migrating towards democracy was evident long before Reagan became President. Yet consider that in just 20 years, the number of genuine democracies in the world has risen from under 60 in 1987 to 90 today. 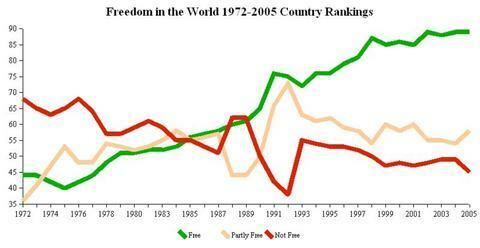 The number of unfree regimes has thus dropped correspondingly. In particular, it is the nations of Eastern Europe that transformed the most in the years following Reagan's speech. Now, almost all the nations of Eastern Europe, including former Soviet states, are full democracies. This would have been unthinkable just 20 short years ago, ensuring that this speech become a symbol of the watershed moment when cracks in the Soviet Union became just too numerous to cover up. General Secretary Kim Jong-Il, if you seek peace, if you seek prosperity for North Korea and Eastern Asia, if you seek assistance from America, come here to this border. General Secretary Kim Jong-Il, open this border. General Secretary Kim Jong-Il, tear down this demilitarized zone! While Kim Jong-Il is an evil psychopath, and certainly should not be compared to Mikhail Gorbachev at any level, this would still bring the spotlight of the world on the oppression and suffering in North Korea, and force Kim Jong-Il to do something to try and save face, which means he either has to make a small concession to the winds of freedom, or react negatively and look even worse. Either way, the onus squarely is placed on him. I believe this template has a role to play once again. That's all very controversial... It was just good timing. Just because of the Reagan's speech, nothing would happen - the USSR was ready to switch to democracy from within, not because of Reagan's speech, or his doings. Mikhail Gorbachev already had the idea of the Big Changes when he entered the Kremlin. I have talked to people from former USSR who were adults during those times. Do you know what's interesting? They never heard about Reagan's speech :) However, they told me that there were numerous movements to change the things in the country, to open it up. Canada and Europe have hight level of democracy then USA, we can see that by their government decisions towards public opinions, etc... I think that chart is very politically influenced and favors nations that need to get the "good public eye". It is a reputed international body that conducts detailed research. Do you have anything to support your disagreement other than "I don't like what it says, as it conflicts with what I want"? The true state of democracy in US is about the same as in the most of former Soviet Union republics due to the current administration politics. More Bush Derangement Syndrome is evident. The US is as repressive as Belarus, Turkmenistan, and Uzbekistan, according to you? Does the Russian media have the same freedom to criticize Putin as the US media has to criticize Bush? Rather, they are democracies because of the USA and Britain. Europe would have fallen to either Hitler or the USSR without the US and Britain. Communist East Germany existed until 1989. Spain was not a democracy until 1981. Italy, France, Greece, etc. also only became Democracies in the last few decades. I would say the US is only partly free. US citizens still have difficulty travelling to Cuba, and one is able to be locked up indefinitely without cause. GK: Whether or not the US 'saved' Europe from Nazism is irrelevant to freedom in the US. The Soviets were much more instrumental in saving Europe from Hitler. That is more a reflection of Cuba than the US. People in Europe are also not allowed into North Korea, and non-Muslims are not allowed into certain parts of Saudi Arabia. This is not a reflection on Europe but rather NK and SA. I would say the US is only partly free. Relative to what? Please clarify. To compare the US to a utopian standard is absurd. On the other hand, to suggest that the US does not deserve to be among the 90 'free' countries listed (which include Mexico, South Africa, Indonesia, and Ukraine) is even more absurd. It is a view that could only be held by someone who knows little about the real world outside America. Does the Russian media have the same freedom to criticize Putin as the US media has to criticize Bush? Yes, I read translations of the russian press, and they do express their opinion freely there, and they do criticize Putin as much as we do Bush, so no biggy. I would not go that far... The European people did convert the government themselves, like for example Portugal in 1974, the revolution without shooting, kudos to them. Europe would have fallen to either Hitler or the USSR without the US and Britain. Big misconception... US joined the Second Front when the course of WWII turned to the West, and Red Army was slowly but successfully defeating Nazis. However, the help from US with outdated tanks and arms did help somehow the Eastern Front armies to stock up. It's just mind boggling for me when they say that Hitler was defeated by USA... while the major job was done by Red Army and european blood. It is a view that could only be held by someone who knows little about the real world outside America. Dont make such assumptions based on a person's opinion. If the opinion is different from yours, it does not mean that it's not right ;) it also does not mean that person is not familiar with the world outside US. I, myself was traveling a lot, and not just as a tourist - I spent at least 3 years in the country, working and absorbing the culture and the history - it really opens your mind. I'm sorry GK, but it seems like it's you who does not see outside the box of US borders (no offense). Obviously no person in any nation is completely 'free' to do as he wishes (e.g. you cannot kill someone). Free in this case refers to the ability of citizens to maintain human rights, achieve equality regardless of race, freedom of mobility, and to speak out against unrealistic, illogical, and unfavorable government activities without repercussion. And I am certainly NOT an American. "Yes, I read translations of the russian press, and they do express their opinion freely there, and they do criticize Putin as much as we do Bush, so no biggy." Except for the occasional assassination or the constant worry that your paper will be shut down. I am not even going to comment on the belief that the Bush administration is secretly making the far left, anti-war, anti-America, anti-Israel, anti-Western media make Iraq look like a picnic except maybe to say: Wow. Personally, I do not attribute much practical effect beyond the home front of this particular Reagan speech - good as it was. Reagan's policy of ignoring the enabling detente nonsense of the day and actually emphasizing human rights in the Soviet Union as necessary conditions for cooperation, is worth a lot more of credit. Yes, I stole this belief from Natan Sharansky but he made such a good case for it that I could not help myself. And whether or not WWII could have been won without America (and yes, a small number of Americans are of the belief that the USA was the only nation in the fight), the war would certainly have gone much longer, have been much bloodier, have resulted in the complete eradication of all European Jews, Gypsies and others, and probably would have ended in a far less decisive manner with Nazis still in power in Germany. America also provided huge amounts of help and financing before, during and after the war to make sure that Western Europe did not degenerate into poverty stricken feudal fiefdoms. Stalin's efforts to (snicker) bring liberty to Europe started after his non-aggression partner decided that he was not feeling very appeased and Stalin realized that, once the weather and poor German performance had done much of his work for him, he could swoop in and enslave much of Europe. What a noble freedom fighter. So that means if you consider the US to be only 'partly free', then virtually no nation is 'fully free' by your measure. Free in this case refers to the ability of citizens to maintain human rights, achieve equality regardless of race, freedom of mobility, and to speak out against unrealistic, illogical, and unfavorable government activities without repercussion. Then America is easily the most free country of all. The richest ethnic group in America are Indians and Chinese, who are richer than whites despite whites being the majority. No whites are persecuting Indians and Chinese for being successful in America. If you think that Russia under Putin has the same freedoms that the US has under Bush, despite the US being fully free (green) against the unfree Russia (red), then that is amazingly ignorant. I have lived in many countries other than the US, and I can tell you that even a democracy like India is not as 'free' as the US. How do you account for the massive number of Russians who move to the US, vs. virtually no Americans who want to move to Russia? I asked you to provide a reputed source to back up your claim that Freedom House's index is wrong, and you did not do that. You have yet to prove that your opinion is supported by anything other than anti-US bias. "World Citizen" sounds like a friend of mine who fashions himself as such, but he's not much more than a citizen of an ivory tower, holed up in a university, surrounded by groupthink. I try to encourage him to seek other viewpoints but he just doesn't see the value in it. Funny, for someone who claims to be so open minded, I've never seen him change his mind. Reagan DID put pressure on the Soviet Union. He knew that their economy was in shambles and his plan was to give it the final push over the precipice. He raised the US military budget from 4% of GDP to 6% - a significant increase when you consider the GDP also grew substantially during his presidency. The Soviet mindset was to always try to match the U.S. in military might, and it put a huge burden on it's already faltering economy. The Soviet GDP was only about 6% of America's, so imagine how much they had to prioritize military spending! Their military was a huge percentage of their entire GDP. When America's military spending rose in the 80's, the Soviet's attempt at parity was the final straw - and it broke the camel's back. When the Soviet Union collapsed, almost overnight it's military collapsed along with it. Officers and enlisted men had not been paid for months - they abandoned their posts and the bases became ghost towns. Navy ships were immediately mothballed and in some cases just left tied to their piers and left there to rust. Another reason for the collapse was that it was becoming increasingly difficult for the communists to control the flow of information to the citizens. The citizens of the Soviet Union were always highly skeptical of the government controlled media and it's constant propaganda, but increasingly they found ways to learn about the world beyond the iron curtain. They know that in the west people lived free, their lives were more comfortable and rewarding, their economies robust. Radio Free America, broadcasting it's message into the Soviet Union, deserves a lot of credit for this. Makes me wonder why a similar approach isn't tried in the middle east. The level of religious propaganda and ignorance is staggering - it breeds extremism and enables brutal leaders to stay in power. Why not try to broadcast a new message to the people of the middle east? Why not drop radios instead of bombs? I'm sure that studies could produce valuable data on what type of programming would be most effective - maybe serial dramas? Or news stories depicting Jews not as apes and pigs but real humans? Or catchy songs about the young girl escaping her genital mutilation? I would consider it a privilege if you would add my blog "The Tygrrrr Express" www.blacktygrrrr.wordpress.com to your list of linked sites if you feel the quality is high. It talks about the depriciation of the US Dollar against the world currencies. I am really curious to know what you think of it. Thanks, it is much appreciated! 1) He talks of 'twin deficits', but a weak dollar shrinks the trade deficit, by definition. 2) The Dollar is weak only against the Euro. It is actually very strong against the Yen. Thus the Yen is even weaker than the Dollar. 3) US budget deficit is shrinking, and is currently only 1% of GDP. The average of the last 30 years has been 2.3% of GDP, so the 'twin deficits' claim is false. 4) The scare tactic of saying the national debt is '$28,000 per person' fails to take into account GDP per person of $44,000. Thus, the debt is the same percentage of GDP for the last 15 years, and is not increasing. thanks for the clarification GK. i didn't think about the GDP per person...thats a good point. some guy over there said - `do you think USA's ratio of 70 times India's per person GDP sustainable? Lets says even it comes down to 35 times in the next 15 years. That would put dollar at Rs.20. what do you think about this GK? Venezuela should be colored red on the map. Canada and Europe are free only because the US has bled to make them so. Russia and China are still abominations to the human spirit. Currency conversion rates have nothing to do with Per Capita GDP at PPP. They are two totally unrelated things, and the question itself from that commenter is a hugely uninformed one. A USD worth Rs. 13-15 may change a tiny but, but not much. India's per capita GDP will not be close to that of the US in the next 30 years, even at 8-9% growth rates. It would be nice if it did, but is just too long of a way to go, even at those rates. Mikhail Gorbachev defeated socialism in the Soviet Union -- perhaps he's the candidate we need to defeat Obama in the United States. Vote Gorby in 2012!